INDUSTRY.co.id - Jakarta, Chairman of the Association of Indonesian Automotive Industries (Gaikindo), Yohanes Nangoi met with Minister of Industry of Airlangga Hartarto at the Office of the Ministry of Industry, Jakarta, Monday (5/1/2018). "This visit is related to the preparation of GAIKINDO Indonesia International Commercial Vehicle Expo (GIICOMMVEC) 2018," Airlangga said. 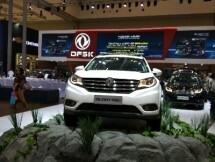 He added that the concept of the event is an automotive exhibition for the commercial vehicle industry in Indonesia. According to him, the event will be held on March 14, 2018 is to support and encourage the automotive industry and assist the development of infrastructure and development in the homeland, especially in the commercial vehicle industry in Indonesia. As is known, Indonesia is the largest automotive market in Southeast Asia. In 2016, the domestic automotive industry produces 1.1 million units of cars. "Automotive business activities ranging from upstream sector which includes raw material industry and motor vehicle assembly industry to downstream sector such as after sales service and financing, very big contribution to the national economy," he said. Therefore, the automotive industry becomes one of the priority sectors of development according to the National Industrial Policy. "With a national production capacity of 2.2 million units of cars per year, the domestic automotive industry needs to maximize the potential to have a higher competitiveness," Airlangga said. Airlangga expects the 2018 GIICOMMVEC exhibition to run smoothly and in accordance with what is expected for the progress of the national automotive industry.